If you are an iPhone users then you must be aware of the less point of Apple’s iPhone is its Battery. With every usage of it the %age of battery decreases. Iphone offers its users whole new world of features, apps, games which cannot be resisted from exploring. But the main concern for the user will be saving the battery throughout the day. 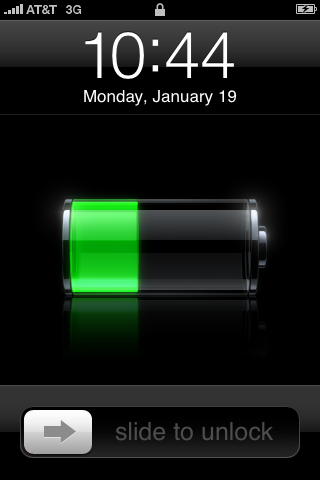 Maximum iPhone battery is 100% and it rapidly decreases according to the usage. But every problem has a fix to it and Apple has done that for the battery issue. So let’s explore these few simple and few little tricky ones to get that extra bit of battery. All the latest phones, being specific Smartphone come with inbuilt wireless applications like Bluetooth and wifi access. So it is advised to switch off such features when they are not in use. As these features tends to deplete your iPhone battery fast. So turning them off can help you extend the battery life for several hours. If not required then disable the 3G as well. As the 3G technology survives on the battery of the phone. If possible to turn off it will give you long battery life for whole day. Make use of the auto brightness feature of your iPhone. This will automatically adjust the back light of IPhone as required. This adjustment also helps in saving battery. Although you have enabled the auto brightness feature but in some scenarios it does not dim the light as required. There you can manually lower the brightness of the home screen for saving of the battery. Preferred is to keep your brightness to 49% to make optimum use of the iPhone battery. According to Apple, the background apps are not technically ‘running’, unless they are front and centre, which means they should not draw any power. The multitasking application for the iPhone continues to use resources of system more efficiently depletes your battery. Applications, for example, Skype or even other VoIP can be especially benefit from the battery when you perform within the setting and so it is better to start launching the applications only when you need which can save the battery life. High temperature of iPhone also eats up its battery life. If you find that while charging your phone the temperature is increasing, then remove the phone cover before plugging in for charging. Let it also have a breath of fresh air so place it on a table or in open space instead of your pocket. The optimum temperature for iPhone and its battery is between 32°F to 95° F.
Solar chargers give you freedom of charging your iPhone from anywhere. So if your battery is dying out, you can save it with solar power. Also another advantage is that you can follow the motto “Go green” while saving the electricity which in turn protects the environment. We all know that iphone is a precious thing for anyone but that does not mean that you restrict its use to protect it from daily wear and tear. It is best valued with optimum use of it. Not using the iPhone for a long time can reduce its battery life. Therefore one should use it regularly and change iPhone battery at least once every 6 months. Apple has also strongly recommends that you should charge your iPhone when the battery is completely finished i.e. 0%. So follow these tips and you can easily save your iPhone battery life and enjoy it for long.